Born in a settlement at the banks of River Nun, lived almost with fishes, but was befriended by the sound of books echoing through the streets. That's the story of Gabriel Imomotimi Gbaingbain Okara, the son of an Ijaw chief, who died at the Federal Medical Centre (FMC), Yenagoa, on Sunday. He was born in Boumadi, Yenagoa, Bayelsa State, on April 24, 1921. 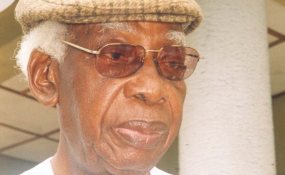 The venerable writer, who was a lifelong patron of the Association of Nigerian Authors (ANA), died a month to his 98th birthday. The Association of Nigerian Authors (ANA), Bayelsa State Chapter, in a statement by its chairman, Mrs Bina Ilagha, said the association was sadden by the news of the death, "because it came at a time when preparations were in top gears to celebrate his masterpiece, The Voice, at 55." For the theatre teacher and former Deputy Vice Chancellor, University of Lagos, Prof. Duro Oni, "at 97 years, he lived long and well! His life was fulfilled. From his famous poem, Piano and Drums to his novel, The Voice, Pa Okara was an eclectic writer. He excelled in poetry, novel, plays and was also deep into broadcasting. His understanding of characterisation in his works was outstanding. His pioneering place in African literature is assured." The art writer, critic and novelist, Molara Wood, said, "Pa Okara tried, and lived longer than most, sitting patiently and quietly through many of those literary meets, particularly, in the last gasp days of the Port Harcourt book scene. "The venerable writer was, in fact, celebrated as part of the events of Port Harcourt's assumption as World Book capita in 2014. Held at the Hotel Presidential, the event was anointed with a host of celebrities, academics and the aged, including Profs. Wole Soyinka, J.P Clark-Bekederemo and Ebiegberi Joe Alagoa. He was very excited celebrating his 93rd birthday. Pa Okara, who walked in without a stick, was clear and sonorous in his speech, said: "I am happy to take part in the celebration of my 93rd year on the planet earth. I am grateful to God for good health and for strength even to climb up this high step of this podium." Talking about the secret of his longevity, Pa Okara was metaphoric. According to him, "in some drugs, there are expiry dates. Same for food. However, what defines a man is his ability to last a long time. Can you accept that you have expiry date? One is kept alive through his activities and strength. He begins to wear away at a certain stage. That depends on the state of his mind to start with. What is in the mind affects your age." Going Biblical, the venerable writer said, "God made man in his image and likeness. It is spiritual. Does God ever die? Does he ever grow sick? Therefore, you will not grow sick or die. What we experience at death is what we believe. What is in the mind affects our life. That is the secret if it is a secret at all. What you think you are will determine what you will ever be. There is no short cut. You work hard." Telling his childhood story almost in poetic manner, he said: "I grew up with the water, fishes and trees. I attended Government College Umuahia, where I was introduced to literature. We were compelled to read one book per week and to make presentations to teachers, afterward. From there, I developed the passion for writing. I was in Gambia for sometime. I also did printing press in Lagos. I was in the civil war and also had opportunities to go for all manner of training within and across the world. I won many awards in the civil service including that of Rivers State and national honour of OON from the Federal Government." The first modernist poet of Anglophone Africa, he is best known for his early experimental novel, The Voice (1964), and his award-winning poetry, published in The Fisherman's Invocation (1978) and The Dreamer, His Vision (2005). In both his poems and his prose, Okara draws on African thought, religion, folklore and imagery, and he has been called 'the Nigerian Negritudist'. According to Brenda Marie Osbey, editor of his Collected Poems, "it is with publication of Gabriel Okara's first poem that Nigerian literature in English and modern African poetry in this language can be said truly to have begun." In 1945, Okara found work as a printer and bookbinder for colonial Nigeria's government-owned publishing company. He remained in that post for nine years, during which he began to write. At first, he translated poetry from Ijaw into English and wrote scripts for government radio. He studied journalism at Northwestern University in 1949, and before the outbreak of the Nigerian Civil War (1967-70) worked as Information Officer for the Eastern Nigerian Government Service.Together with Chinua Achebe, Okara was roving ambassador for Biafra's cause during part of 1969. From 1972 to 1980, he was director of the Rivers State Publishing House in Port Harcourt. In 1953, he got the Best All-Round Entry In Poetry prize at the Nigeria Festival of Arts, for The Call of the River Nun. In 1979, he won the Commonwealth Poetry Prize, for The Fisherman's Invocation, while in 2005, he was joint winner of the Nigeria Prize for Literature, with The Dreamer, His Vision, and in 2009: Pan African Writers' Association Honorary Membership Award. Talking on how much he made from his first published work, Okara said: "One thing I will like to make clear is that it may appear strange to non-creative writers. I wasn't taking money when I started writing. I created passion for writing especially with the conflict in the society. There was a time that the British Council invited me for a poetry programme. I was so happy when it was broadcast. Later, I was asked to come and sign for the money for the service. I was shocked and I asked, 'which money?' I was happy for the joy of being heard. It was 10 pounds. That was big money then. All I wanted was a forum to express my feeling. The muses drove me. That was writing then. I was also happy with the Commonwealth Prize when it came at last. I was given N500,000 as a joint winner. The joy was in the acceptance of what is written by the generation of loving people of Nigeria." What then was the concept behind the writing of this sage? "The concept of my writing is feeling, sensitiveness to situation, peculiar thought, which others may not have. To me, what keeps me in writing is the desire to express the scene around me. I am driven not by fame or money but by sheer desire and pleasure for writing. Sometimes, I write on what makes me angry as well especially in my poetry." He used the forum to explain what motivated him to write his popular poetry collection, Call of River Nun. "I was in Enugu when I wrote the book. The concept of the poem came to me when I climbed to the top of the hill and watched the insects, the soldier ants, in group, carrying their loads. I began to wonder on such a territory and such manoeuvres these insects were demonstrating. Also I thought about my childhood; how different was the atmosphere in the creek compared with my new abode at Enugu? I began to think about my life journey in the River Nun. I remembered my early childhood. The Call of the River Nun may be described as a poem of remembrances, desire to live freely without any fear, without any enemy. I remember all that happened in the decade that you might have achieved," he said of the poem, which resonates with a lot of readers and lovers of poetry and, even non-lovers of poetry, because it is easy to understand and relate with. "Well, it still gives me the impression that good intentions, good motives, good ideas do not die. I feel the same thing as when I was writing; the same emotion, the same persuasion about the society, about life itself. Some people think that there is no end to life, physically. Ideas don't die if they are good." Though he started his career in writing as a playwright, he later dropped the idea. Why did he quit? He has this to say: "I cannot remember any more. It proved to me that I was on the wrong path of my creative writing. I discovered that poetry was my calling. I also wrote short stories. "Okara also declared his stand on indigenous literature and the need to protect African culture. "In what language do you read? Is it the language of your colonisers? Language grows up with the culture of the people. You are known and identified by the culture of which you are nurtured and in which you grew up. So, in Nigeria, we have several languages. The common language is English. If you want your writing to be read and appreciated outside your enclave, you have to write in English language. While doing that, you have to give some sacrifices to your culture too. In Ijaw, when you say somebody is afraid, you say the person has no chest, because we believe it is the chest that gives courage to struggle for livelihood. If someone has no chest, it means he is a dead person or can someone live anatomically without a chest? This symbolises the kind of life people live in riverine area. You have to fight and struggle. Bravery, strength is embedded in one's heart. Without bravery, you cannot live in those days. If there were something he would have loved to do as a writer, it was writing more about corruption. "I should have written more on the fight against corruption. I wished I had written some plays. If I were to have written any play, it would have been on corruption," he said. He told The Guardian why the subject of corruption was close to his heart. His words: "I was brought up in a family known to be straightforward people. My father, for example, was a chief, who was known to be straightforward, and so that is why I believe in straightforwardness and honesty." He added, "that was why I wrote the book, The Voice, the voice against corruption, but hope never dies, the hope that one day things will change for the better in the end. One of the things that have guided me in life is truth. It is my hope that things will change for the better in the country."